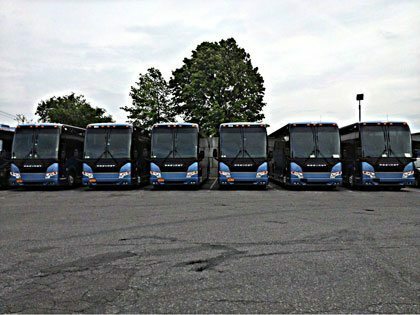 When planning a large group visit to New Jersey, a charter bus rental may be the best option for ground transportation. Best Trails and Travel has been operating charters in New Jersey and the greater New York City area for years. When doing research to book a charter bus, New Jersey has a lot of choices. BTT offers luxury coaches fully equipped with TV, DVD, CD, Wi-fi and tables. With so much to do and see in New Jersey, why not travel in comfort and style? Choosing to charter a bus is now one of the most economical choices you can make when planning large group trips. With the rising cost of fuel and unreliability and limitations of air travel, when you decide to use a charter bus New Jersey, NJ can be the destination or just a part of your trip. Best Trails and Travel's outstanding customer service representatives will gladly walk you through the planning process of chartering a bus in New Jersey. We are committed to providing our customers with the ultimate experience in chartering a bus in New Jersey. Our professional drivers are highly skilled and experienced in navigating the roads and handling large vehicles and coaches. On a charter bus New Jersey, NJ has so many sights to see and even more to do. Best Trails and Travel offers several package deals to the local attractions and amusement parks. Call us today at 212-206-6974 to see how we can help you see New Jersey. Best Trails and Travel: Charter Bus New Jersey Style!